Grendel Games is responsible for one of the most intriguing titles to arrive on Wii U in the early weeks of 2015; it's available in Europe and arrived in North American soon. Underground was originally conceived as an entertaining tool to assist surgeons with their laparoscopic surgery motor skills - or key-hole surgery, as it's also known. The core idea of puzzle solving by controlling two robotic arms makes for an entertaining game in itself, however, and we were thoroughly impressed in our Underground review. We caught up with Jan-Jaap Severs, development director at Grendel Games, to talk more about the project and how it made its way to Wii U. Can you introduce yourself and tell us about Grendel Games? My name is Jan-Jaap Severs, development director at Grendel Games. I co-founded Grendel Games with Tim Laning in 2003. With 16 employees we are one of the larger companies in the Netherlands focusing on the development of serious games; games in which entertainment is not necessarily the primary goal. We have been developing games for a variety of purposes and target audiences ranging from laparoscopic surgeons to children with acquired brain impairment. Let's start with the origins of Underground, how did this project and the link to medical world training come about? We were approached by a surgeon of a regional hospital, Henk ten Cate Hoedemaker. He first came up with the idea to try to use game technology to make the training of laparoscopic motor skills more enjoyable. Many of the regional hospitals have a dedicated training center with specialised equipment available for training these surgical skills. However, by their very nature these simulators are not really fun to use. We discussed ideas to create a game that 'hides' the training aspect of these skills in an attractive and fun environment. This has resulted in the founding of a separate company with two hospitals and Grendel Games as its stakeholders. Has the game design, with multiple worlds and boss battles, always been part of the experience throughout development, or were these aspects brought in once a wider Wii U eShop release was decided upon? Absolutely, we have always aimed at creating a title that would not distinguish itself from other titles available on the Wii U platform. All the levels and themes relate to one or more surgical skills. These skills progress in difficulty as the game progresses, and the boss fights are a sort of 'final test' to see if you've mastered the skills introduced in the preceding theme. We feel it's important to offer both the surgical as well as the entertainment audience an authentic 'entertainment gameplay experience'. Surgeons love the game because it's so different from regular simulators. Our hope is that the wider Wii U audience also appreciates the game separate from the surgical context. Can you walk us through the core concept, then, and how these robotic arms are utilised and controlled in the game world? 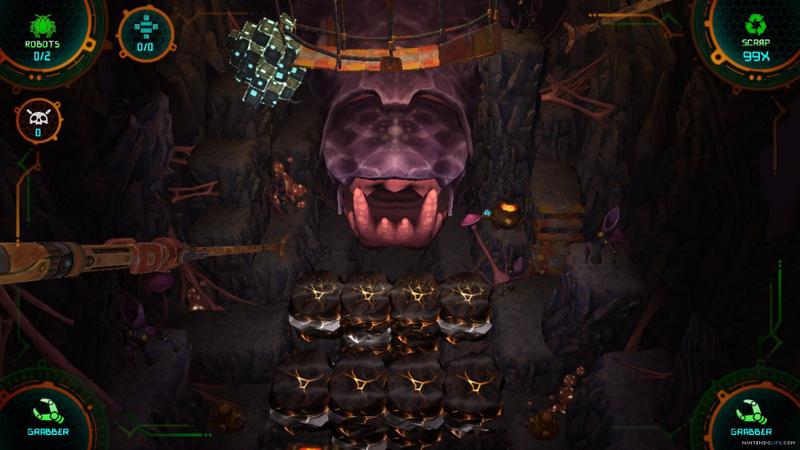 In Underground, the player takes control of a large vehicle driven by the robot, Sw4nk. This vehicle is equipped with two large mechanical arms suited for underground mining operations. The arms come with a set of tools to drill into large rocks, pick up and move around debris and weld pieces of scrap metal together. 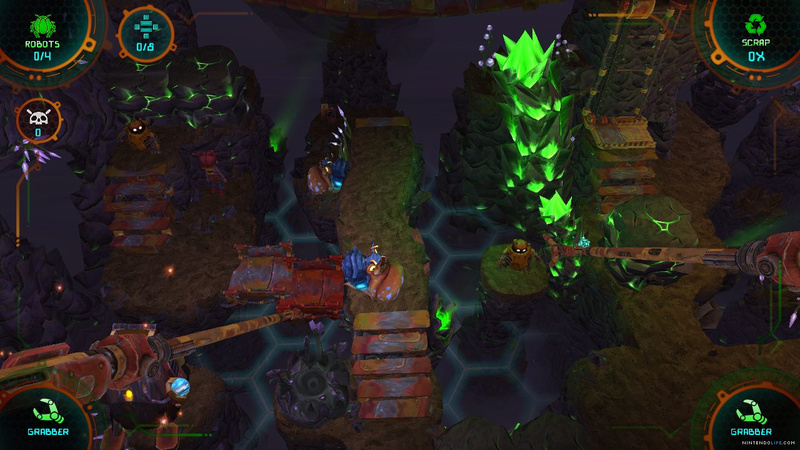 The player uses these tools to create structures like elevators, stairs and ramps to create a path from the start of each level to the exit, enabling the robots trapped in each level to advance to the next stage. Every level has a multitude of different routes available to be explored. Boss fights conclude each of the four available themes. The arms on Sw4nk's vehicle are inspired by the instruments used daily by laparoscopic surgeons. By using a specially designed Wii U controller to play the game, players can mimic the exact motions and gestures used by surgeons, which results in a training effect. The way the environments are designed takes into account various aspects surgeons encounter in their practice: low light environments, poor depth cues make it difficult to estimate distances and you cannot go around just poking into everything. We have tried to give these elements a place in the game so as to make the training experience as realistic as possible. 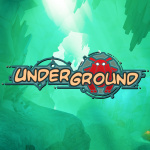 What drove your decision to bring Underground to the Wii U? This project came to life before the release of Wii U. We originally started development for Wii, because it was the only console available that allowed us to have a high enough precision infrared controller. As development progressed we realized that we couldn't get the graphical quality we wanted to achieve unless we would switch to Wii U. We were also very relieved that Nintendo confirmed compatibility with the Wii Remote and Nunchuk, the main hardware we depend on for our own surgical controller. As it utilises dual stick controls, is there support for the Wii U Pro Controller and Wii Classic Controller? There's no support for the Pro and Classic controllers. The game can be played either using the Wii U GamePad or using the custom controller we developed for this game. With the latter, actual movements used by surgeons to perform laparoscopic surgery are used to control the game. Are the GamePad's features - with a touch screen and motion controls -- utilised in any way? The GamePad's touch screen can be used to switch between the various tools, a drilling and a welding tool, among others, that the player can use to interact with the game world. Is this single-player only, or are there multiplayer options available? The game is single-player only at the time of release. We hope to be able to offer multiplayer functionality depending on the interest in the game. I'd like to think a little bit of competition between surgical professionals might enthuse them to train some more. Has there been much interest, to date, from the medical industry in the combined product of the software and external controller? Yes! We have brought this game to a series of medical conventions for demonstration and feedback purposes, and the response has been very positive. Surgical professionals recognize our efforts to make training more fun and they are enthusiastic about the looks and gameplay of Underground. The professionals say that controlling the game using our custom controller mimics the feeling of operating very closely. A PhD validation study focusing solely on Underground and its controller and the effects they have on surgical training has been completed to make this feedback more measurable. Are you optimistic that this title will be popular among the Wii U audience? We hope the Wii U audience will receive Underground with as much enthusiasm as it is received in the surgical community. Do you have future plans for DLC and new content in Underground, expanding the IP further or any other eShop projects in the works? Definitely. This IP is not only suited for the set of laparoscopic skills currently in the game but it can be expanded much further. New themes and levels can be created around different surgical skills and different gameplay types may even lead to new games entirely. Finally, do you have a key message to share with our readers in relation to Underground? We've tried to bring a serious training experience to a mainstream console, in a form that will hopefully also interest an entertainment audience. 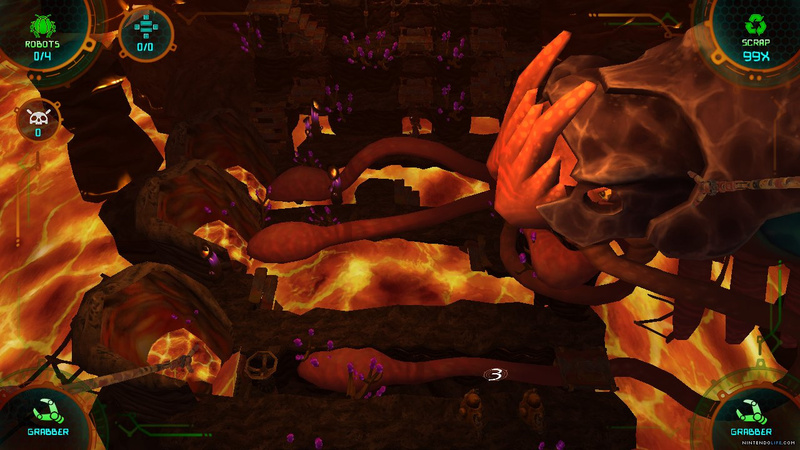 With Underground we try to show that serious games do not have to be boring and stale, but that with a little imagination, learning and training can be made into an enticing experience. We'd like to thank Jan-Jaap Severs for his time. Definitely sounds interesting enough for a pick up after the review. I really hope this gets released in America. I would love to try it. Especially since I'm studying to be a doctor now. 1. So how much is the special controller? Any pics of it? 2. Does the GamePad emulate the original controls (with special controller) well or is it a different, classic configuration? 4. How many stages are in the game? Approx. game length? 5. Why is it 19.99€? For 19.99€ I expect a premium indie with fantastic audiovisuals and good content. I mean, the most expensive indie before Underground was Trine 2 Director's Cut (16,99€). All other Wii U indies never charged more than 14,99€ (not counting a few games with paid DLC). This game needs more coverage, a video/trailer on the eShop at least, if not a demo. Hope there's some gameplay footage on YT. I remember Grendel's first game on WiiWare, Diatomic. Looked interesting, had unique controls as well, but wasn't available in Europe unfortunately. They have a pic of the custom controller on their site. It uses 2 Wii remotes and 2 nunchucks. They have an interesting video (interview/presentation) on there as well. The game is pretty cool! I wasn't expecting such good production values given the background. Enjoying it so far.